This Rumble ended on 2002-01-31 00:00:00.0. Famous For: Having an achy breaky heart for a certian female Dragon Highlord. Quotables: "Do you want Malystryx, Dhamon Grimwulf?" Why he'll win: Highly intelligent, has superpowers and he is one of the most powerful dragon overlords in Ansalon. Looks: A giant blue grape meets a 18 wheeler. Currently Spends Free Time: Making spawn, searching for Kitiara and trying to kill Palin Majere. Famous For: Being the most powerful overlord in Ansalon. Achilles Heel: Doesn't know when do give up. Quotables: "This is war, and this is just the beginning." Looks: The grinch meets a flying red tomato. Currently Spends Free Time: Training spawn, plundering villages and killing other dragons. Likes: For you to be dead (Unless you are an ally). "Nobody saw this one coming..." said Khellendros' representavive spawn Bob. "This will be a masacre no doubt about it" stated Malystryx's representative Su. Two of the most powerful dragon overlords to ever fly over Ansalon will clash. Khellendros said "I will do this for Kitiara" and so did Malystryx. Everyone thought there was going to be a free-for-all this afternoon is Sancrist but it turned out there wasn't. 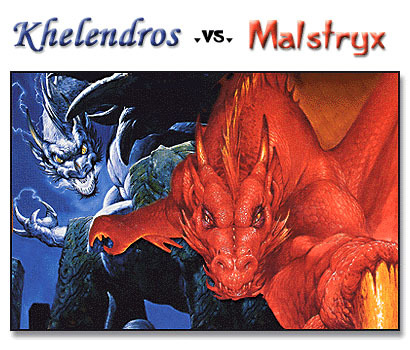 Khellendros stated, after that comment, there was going to be no chance that Malystryx could win. "Yeah, yeah, I know; she might be even bigger than Takhisis herself but once someone messes with my Kitiara there'll be no stopping me." Malystryx, was positive she would win. "I can do it on my own," she then "incorrectly" stated that "I wouldn't be here today if it wasn't for my friends." The other dragons were on Mal's side but once they saw Khellendros pull his "mad dog" impression they reconsidered. It seems Mal's "friends" won't be attending the fight in the end. Khellendros boasted that "my mad dog impression scares everyone off, wait until I use my dirty duck, stinky snake and buttery badger impressions on Mal." Malystryx was fuming after that comment and another one about her being "large". Khellendros also thought she would lose because she was a "sissy-girl who always gets her way." Mal was so upset she almost backed down from the competition but then she mentioned that Khellendros had a thing for humans. "I'm serious, he has had so many chances to kill them and he just lets them get away." There some more remarks but they have been stricken from the record. After that, Mal started to cry and Khellendros pulled his Mad Dog impression and then the conference ended. Mal said she had to meet some friends and get ready and Khellendros said he had to talk to his mom and spawn. It seems that the anticipation of this battle has decreased.